This magazine article explains what a unique force in presidential history Eleanor Roosevelt was. She defied convention in so many ways and to illustrate this point, this anonymous journalist went to some length listing fifteen "firsts" that this most tireless of all First Ladies had racked-up through the years. "'A Japanese is always a Japanese' is an easily accepted phrase and it has taken hold quite naturally on the West Coast because of some reasonable or unreasonable fear back of it, but it leads nowhere and solves nothing..."
"Mrs. Roosevelt's governmental activities are approved by those who see in them altruism, sympathy for the downtrodden, and a great desire to serve others. Her activities are opposed by those who feel that she is not properly a public servant because she is not responsible to the American electorate or directly accountable to it at election time." 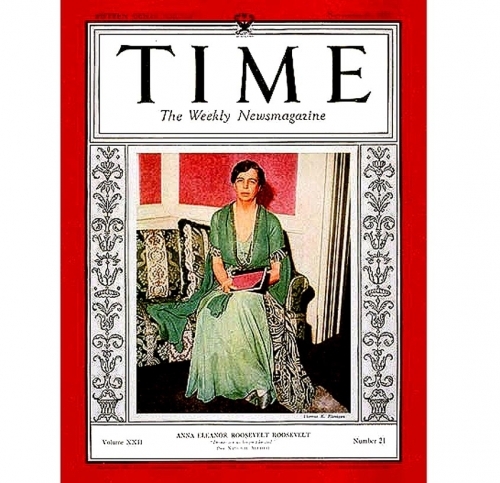 "Besides teaching American history and English literature three days a week as vice principal in the Todhunter School in New York (having to commute from Albany), Mrs Roosevelt runs the Val Kill furniture factory where reproductions of early American furniture are made to give work to the unemployed on the environs of the big Roosevelt estate at Hyde Park, N.Y. She belongs to several women's clubs but never neglects her duties as mistress of a governor's mansion..."
"Half a dozen women who have known Eleanor Roosevelt in the past twenty years all agree that this is the first president's wife in not a few presidential terms who might have achieved election to something in her own right; who might give ear to the women of the country. And although just listening to other people's troubles isn't enough, it is conceivably something." A column from a 1937 issue of PATHFINDER MAGAZINE included these two seemingly random tales from the life of First Lady Eleanor Roosevelt. The brief remembrance on the second page is a bitter-sweet story about young Eleanor and her mother's vision of her as a hopelessly plain-looking girl.